...when you are on a break from the blogosphere. Has it really been 6 weeks? As with art, one needs some time off from blogging in order to come back with recharged batteries. Or something. So, the studio is active and messy, new ideas keep popping up in my mind, I've had a sleepless night with the adrenaline rushing through my (hmm... what does adrenaline rush through? veins? capillaries? Arteries?) followed by a merry night of trying to put what I had in mind to paper - quite exciting, actually. I will post those once they all reach a finished stage. Today I can share the little flower I made. By now, you may know that I do not paint flowers. However - a friend from our critique group had a medical emergency. Needless to say, sending flowers came up, but then WebbieM suggested a clever alternative: that instead, we each paint a little flower, as that won't have any issue of potential allergies; plus - they will keep longer. MembieK (whose name should now be changed to EmeritiK) took it a step farther out, suggesting we make a book-thingy from all the painted flowers. FergieJ created one and brought it to critique, where we all glued our little masterpieces into it and wrote something for our friend (who - I am happy to report, is back at home and very well, thank you for asking). This little painted flowery bouquet turned out a real beauty. OK - have I mentioned that I do not paint flowers? 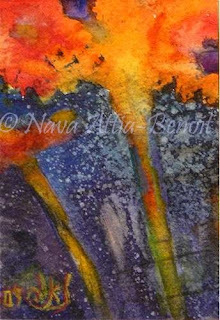 Indeed, I was positively terrified: how can I paint a flower? but then again, how can I not be a part of this project that's all about friendship and support? So, Wednesday night, just before the critique meeting, I got into my studio at 10:30pm, and - - - well, I have to admit: I had fun! 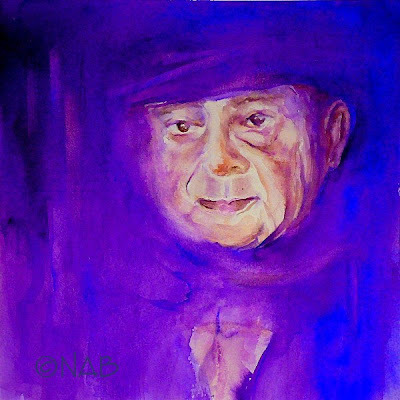 Still claiming my basic right to complain, I informed WebbieM that if I am ever in a hospital, I would like each and every one in the critique group to paint a portrait, just so they go through the same fear I felt. I know, I know; one should look at everything within the big scheme of things, have the right perspective on life and possess a healthy sense of proportion... And yet: a flower!!! Anyway, here it is. My second painted flower ever (at least in my adult life). It's tiny: 2.5" x 3.5". But hey, it's a flower. Y'know how I always claim that I'm gonna do a series of paintings whenever something captures me? And then I move on to the next exciting image? Well, not this time. Apparently, this image did captivate me. 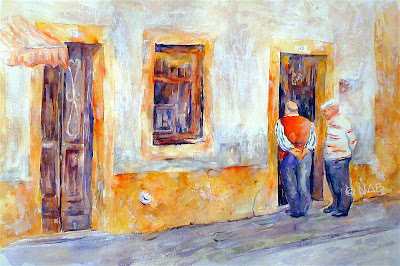 Not quite sure why - maybe it's the fact I loved Évora so much, maybe these two men and their curious stroll appealed to me, or maybe the fact that my second attempt at buildings since I've started to paint turned out to be so much fun. Add to it the fact that I wasn't overly happy with the composition and format of the previous version - - - I decided to give it another try, and do it bigger. Took out a half sheet of watercolor paper, changed the composition to be horizontal, being cautious with perspective and all that, and had tons of fun. I changed the men a bit, as they came out a bit too cartoonish in the previous version, and I wanted it to be more of a painting than a sketch. So, I gave the pot-belly guy a quick tummy tuck, changed the clothes for the sake of color consideration, and treated the building a bit differently, going for an even more weathered and peeling look. At a certain stage, it was a nice watercolor. Fresh colors, hardly any texture, clean washes - like a watercolor should be. The JohnnyB liked it a lot, but I lost all interest in it. To me, it seemed boring; it lacked a story or emotion whatsoever. The JohnnyB said "I've seen paintings with less of a story to them in shows and museums". Well yeah, so have I. Thing is, I did not want to produce this kind of painting. Which started an interesting discussion: who do we paint for? Are we trying to please our spouses/friends/teaches/critique groups? And if we do produce a painting that makes others happy but we are not satisfied with it, what's the point of creating? Do I want to leave it at the safe stage where it might get compliments but won't make me proud of it, or do I dare taking it a step or two forward? Frustrated, I took out the white gesso and tried to give some character, breaking the overly-straight lines, adding texture and pretty much molesting the pureness of the colors. Ahhh - that was more like it! As LimaB put it "This is so much more alive!". I like it much more now. Not sure if there will be a third version of this one, though, as I have other Portugal images that sit in my head and demand to be portrayed. Plus, I cannot guarantee the man on the right will keep his pose for long... poor guy, he's been waiting waaaaay too long for his friend to move aside and have a peek at that door, I can't help feeling he's just about to explode. 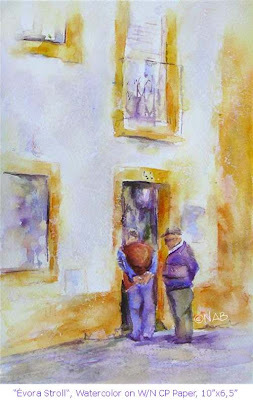 "Évora Stroll #2", Watercolor on W/N CP paper, 21"x14"
Do you ever feel that force majeure is getting in the way of settling on a planned route? You go on the freeway with a destination in mind, and suddenly you see an exit that calls for you, and you take it, surrendering to your gut feeling? I have quite a few paintings in my queue. I'm still working on the untitled acrylics guy; I have another version of my grandfather in mind; I really need to start that commission; I already did the drawing for a new painting that's been marinating in my head for a while; I . . .
. . . and out of the blue, my sister has emailed me this incredible photo of our father (who died just over a decade ago). It's a photo I've been dying to have, a very unique capture of him a couple of years before he died. OK, you know what's that means - I tossed everything aside, cleared a little space on my overloaded desk in my insanely messy studio, grabbed some watercolor paper, dipped my brush in some paint and just followed my overflowing heart. Two hours later, I was done, and exhausted. And to think painting my grandfather seemed like an emotional journey... well, Einstein's theory of relativity was proven, yet again. The painting got quite a few constructive comments at our critique group, which I agree with in the sense of design and composition. However, I realized it may have been a mistake to bring this kind of painting for critique. To me, it was all about the courage it took me to paint him, the feeling I had when I was caressing his face with my brush, and my success in capturing exactly what I was going for. The elements of design were not at the top of my priority list with this one. So, that was quite a detour from the "appropriate" way to paint. And it made me realize that taking the scenic road from time to time - even if it doesn't lead to a preplanned and well defined destination - is OK. It's more than OK.
We'll be taking a lot of scenic roads in the coming couple of weeks. The JohnnyB is in dire need of a vacation, and due to the restricted time-window dictated by his work, we found ourselves on a spontaneity spree in a very fast-forward mode of pondering-considering-discussing-deciding-arguing-deciding-doubting-deciding-stressing-deciding-booking-planning a 2-week timeout. 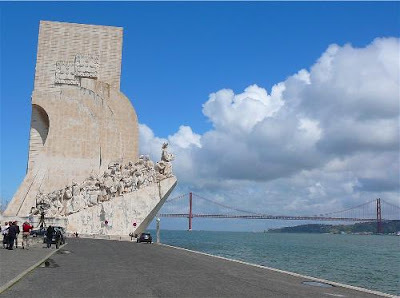 To contrast the hectic pace of the Bay Area, we chose one of the more laid-back countries in Europe, that seems to be beautiful and charming and welcoming and different, with a language neither of us speaks. After posting this painting, I went to visit some of my favorite blogs to see what's been going on there while I was out of the blogosphere. 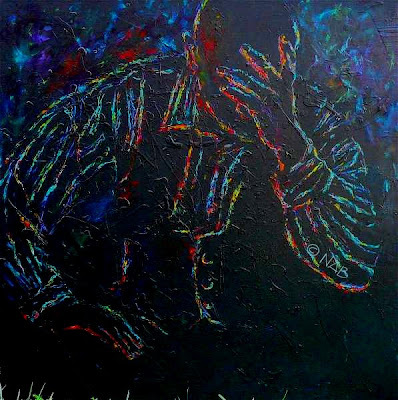 And - lo and behold, I was astonished to find the soul mate of my cheery guy, in a wonderfully powerful painting done by Bonnie Luria of the St. Croix-nicity blog. Haven't disappeared. Just took a break, turned 46, and - actually been painting. The kind of painting that takes forever. No, it's not the procrastinated commission (the deadline is June-ish, so of course I am doing everything I can to not do it yet...). Been working on a new painting that was marinating in my mind for a while; a new style, new medium, new support - and it's having countless iterations. When I brought it to the two critique groups I belong to, there was a multi-shock effect by me working in acrylics (Nava? Acrylics?) on a relatively nice-sized (Nava?? Big??) canvas (Nava??? Canvas???) with relatively cheery colors (OK, you get the idea...). There is something very freeing in trying somethign new. Plus, after almost 2 years of intentionally avoiding the use of purely line (I was forcing myself to learn more about shapes), it feels sooooooooooooo good to be back in my comfort zone and play with line like there's no tomorrow. So - here it is, acrylic on canvas, 24"x24" (hey, stop snickering! To me, that IS big!). Not yet titled, still unfinished, yet to be reworked and metamorphose until I'm happy with it. You are more than likely to see it again in its next stage. It seems to stir up some serious emotional responses - I wonder what's yours.